To get to this dialog in TextConverter, click the Set Output DB Table button ( ) in the upper right pane (the Output Pane) of the user interface, then click the File tab. 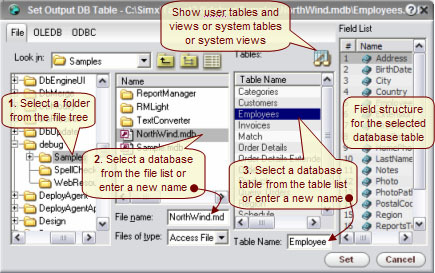 The "File" pane of the database connectivity dialog provides database access to flat files and file based database tables. Use this tab to navigate the file system to connect to DBase, FoxPro, MS Access, Excel, text files, etc. Double click on a folder in the file system tree (left part of the pane) to browse the list of available database resources for that folder. Change the file type to narrow down the visible database types (*.dbf, *.csv, *.mdb, etc. ). 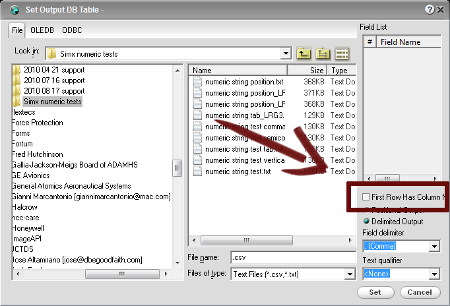 In the case of flat database tables like DBase or CSV, selecting a table in the file list will display its structure in the field list on right side of the pane. This feature allows you to make sure that you are looking at the right table without even opening it. - to connect to a new data source, which will be created as a result of a future process (tool specific). The image below shows where you can control (check or un-check) the "First Row Has Column Header" in the set output data source dialog. This allows you to include a header in the first row of the output file using the field names from the output dictionary.